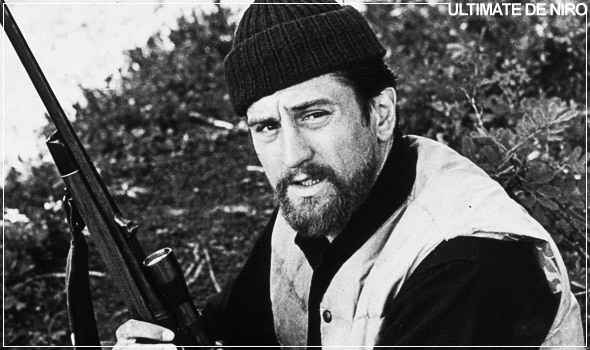 In the first part of The Deer Hunter, the character arc of Michael surrounds him enjoying the company of his friends at Steven’s wedding. Michael on one hand appears to be reckless and immature, for example when he squeezes his car between the truck and wall, when he runs in the street naked and also when he refuses to give Stan his hunting boots. We simultaneously see him as a caring person when he runs after Steven on stage and makes sure he has a coat on. In Vietnam Michael’s character arc revolves around making sure Steven, Nick and himself get out alive. Michael comforts and gives strength to Steven, he devises a fearless plan with Nick and escapes death. When the helicopter comes to save them, Michael sends up Nick first and when Steven falls back in the water, Michael drops in right after to save him. When Michael leaves Vietnam and comes home, his character arc involves getting Steven and Nick home. Michael avoids his coming home party, perhaps feeling guilty about not returning with his friends. Michael tries to resume hunting, yet does not gather the strength to shoot a deer which symbolizes his growth into a mature and caring man. Michael focuses on getting Steven home from the Veterans Administration Hospital, and finally returns to Vietnam to get Nick who has taken up Russian Roulette as a profession. Thus the underlying arc throughout the film is Michael assuming his leadership role and protecting his friends. When Michael sits down across Nick to play Russian Roulette, he pleads with his hand out “don’t do it” however Nick shoots the gun. Michael cringes and sighs in relief that Nick has not died. This is a major contrast from the last time Michael and Nick played Russian Roulette. Michael at that point was fearless and didn’t even flinch at the sight of a trigger being pulled. We see Michael continuously looking down in sadness and thought, thinking about what has become of Nick. It is evident that Michael is not as unaffected as he seems, clearly he was just acting brave for his friends. When it’s his turn, Robert De Niro’s depiction of Michael’s fear is compelling, the way his hand is shaking while he slowly pulls the trigger, and how he closes his eyes and says what he thinks will be his final words. This is the most profound scene of the movie, De Niro’s physical truth reveals the true essence of Michael’s character, he is a protector. He is the leader of his friends and willing to sacrifice his own life to save them. Although he escapes death, his relief is short lived as Nick shoots himself in the head and dies before him. Michael jumps and grasps the wound of his dying friend while screaming and crying. Michael shakes Nick’s head violently in horror, like this can’t be happening. This is the first time we see Michael physically unravel and react so emotionally and it is because he feels he has failed as a protector.